Interior design studio Alfons & Damián have carried out this refurbishment project for Bar Michigan, a neighbourhood bar on the corner of Casanova and Travesera de Gràcia in the Sant Gervasi – Galbany neighbourhood of Barcelona. The project involved the enlargement and complete transformation of the interior including bar counter, dining area and kitchen as well as a new façade and street terrace. 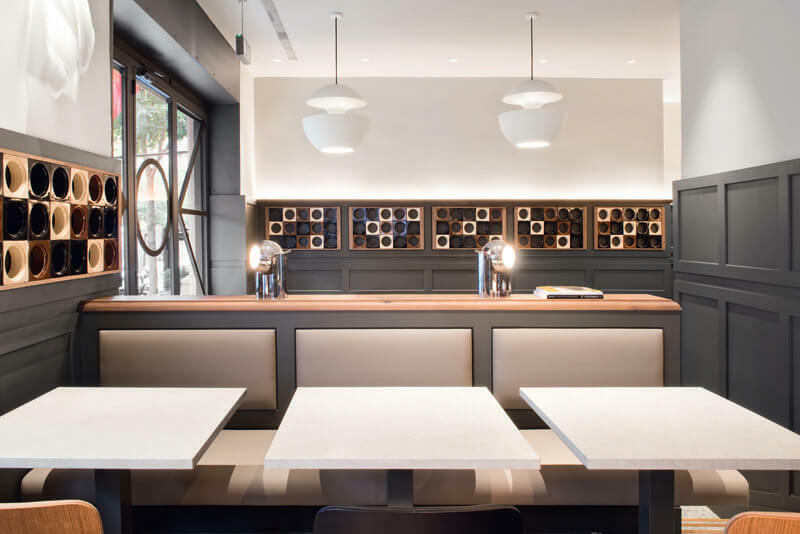 The designers used dado wood panelling to create a sense of continuity between the different levels (between the main dining area and the bar) while the windows have been replaced with guillotine type frame allowing for a more fluid relationship between the inside and the outside. 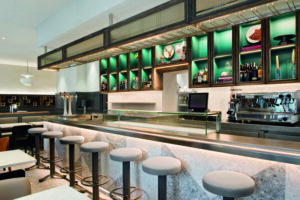 At the heart of the design is the new bar counter which anchors the different materials used for the refurbishment. Brightly lit with an overhead glass shelving system for storing glasses the stainless steel counter is supported by a classic diamond pattern reconstituted stone panelling that is also used for the spandrel panel below the exterior glazing. 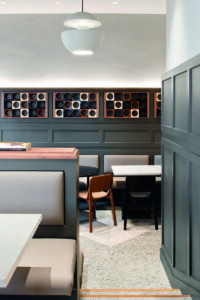 Other materials include a 3D ceramic frieze over the dado panelling, a grey colour porcelain floor tile, upholstered banquette seating and a Alfons & Damián designed marble table. 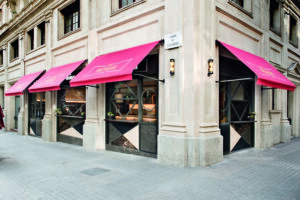 The style is contemporary classic with a modern art deco feel that is expressed through the geometric motifs of the fenestration and the stone cladding for the bar counter and external façade. 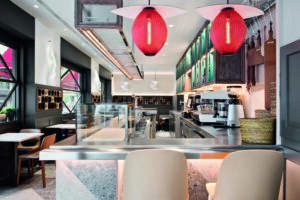 The lighting includes wall lamps and a bespoke installation over the bar counter.